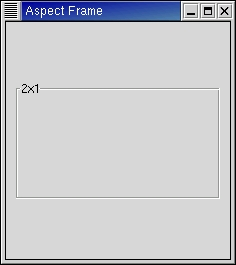 The aspect frame widget is like a frame widget, except that it also enforces the aspect ratio (that is, the ratio of the width to the height) of the child widget to have a certain value, adding extra space if necessary. This is useful, for instance, if you want to preview a larger image. The size of the preview should vary when the user resizes the window, but the aspect ratio needs to always match the original image. label specifies the text to be displayed as the label. xalign and yalign specify alignment as with gtk.Alignment widgets. If obey_child is TRUE, the aspect ratio of a child widget will match the aspect ratio of the ideal size it requests. Otherwise, it is given by ratio.